This is the ultimate, all-inclusive New Zealand lifestyle tour. A day of engaging and hands-on touring, escape for the day and learn everything there is to know about living in New Zealand. From Oyster shucking to sheep shearing and a Maori village tour, you'll come away feeling like you got to know the 'real' New Zealand. Visit the beautiful Omaha Beach and view awe-inspiring pouwhenua (carved Maori posts). Choose to watch or partake in a friendly game of rugby – our national game; what every New Zealand child grows up playing. Choose to include a NZ Food Oyster Tour and savor some of the country’s fresh, plump succulent oysters. Discover the art of shucking an oyster. 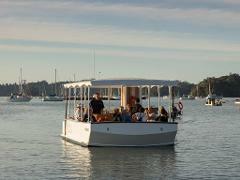 Doing the Oyster Farm Tour aboard the small ferry is an option for private groups of 6 or more. 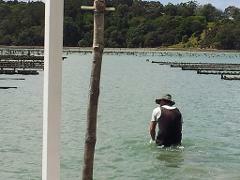 Meet the growers and enjoy historical Harbour anecdotes given by the charming farm owner. Experience the harvest up close. Add 60 minutes to time and $50pp. Visit the New Zealand Wool Products retail store; New Zealand wool products make for a fantastic memento or souvenir to take home. Take home a Matakana Coast Goody Bag to remind you of everything you enjoyed on tour.